Shipping rabbits. It seems like a daunting task if you have never done it before, but it's really pretty simple. I always have my customers buy the carrier & feed/water accessories and have them shipped to my house, do COD with the airlines (payed by the customer upon arrival). I also have my customers either pay the vet directly for the cost of the health certificates, or pay me and I pay the vet. Because fuel prices are high these days, I add on about $75-$100 to cover fuel costs to the vet and airport (vet is 20 minutes one way and airport is 1 1/2 hours one way from my rabbitry). Getting a health certificate from a vet can be pretty smooth, if you have a good vet. A health certificate consists of the vet taking a quick look at the rabbits to make sure they're healthy, writing down the name, address and phone number of the place the rabbits are shipping from, and the name, address and phone number of the destination. The most important part of the health certificate process is to remember to have the full name, address and phone number of your buyer. The vet cannot give you the health certificate without this information. You will have wasted your trip to the vet if you do not have this. Typically a health certificate costs $20-$50 depending on the vet and how many rabbits are being shipped. Now, if this is an international health certificate for an international shipment, it costs $85+ because of USDA involvement. There are some states which do not require a health certificate, so it would be best to check with your state to see if this expense is necessary or not. There are special requirements when shipping rabbits. 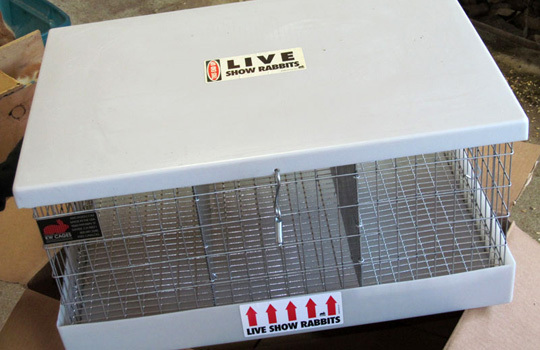 The carrier cage must be big enough for the animal to turn around in the cage. There must be a solid top and bottom on the cage. The carrier must be able to be opened easily for police search or for the airline company to provide feed/water (if on a long trip). 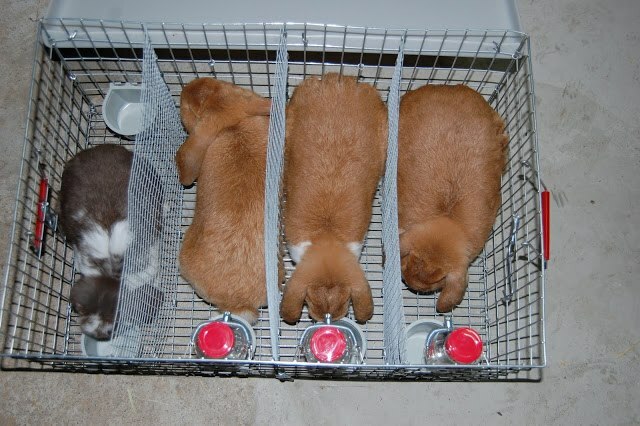 Since KW Cages is limited in their carrier cage sizes, you can also take out the dividers and replace with wire or use the existing coroplast dividers plus cardboard for the additional holes you want to make. I did a shipment of 4 Mini Lops one time, but we used a 3 hole carrier (as you can see above). We took out the coroplast dividers and replaced with hardware cloth. 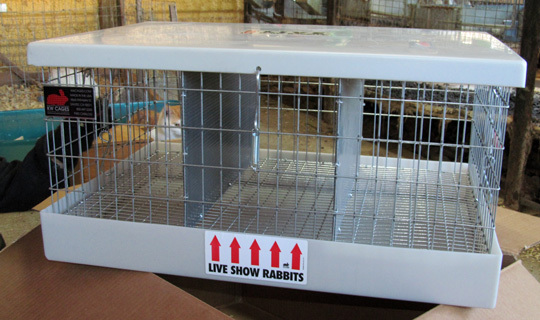 This also helped allow more airflow between the rabbits (something to consider doing when shipping in the warmer months). You will also want to order feed cups and water cups or bowls. I use the plastic coop cups from KW Cages and the small 4oz water bottles from KW Cages. These make it easy to place the feed and water accessories inside the animal's carrier spot without taking up too much of their space. There are many airline companies that ship rabbits. I have always used and been happy with Delta's pet shipping program. They are easy to use and I've always had good results. Shipping through Delta runs approximately $225 (and up, depending on weight). $225 is up to 30lbs, if I remember correctly. You can typically ship 3-5 rabbits for that price. The flight has to be booked over 24 hours in advance to when you want the rabbits to depart to be able to receive the best price. After 24 hours in advance, the price goes up a lot. The rabbits must be dropped off at the airport 2 hours before the flight is scheduled to leave. You will need the health certificate & the name/address/phone number of the place the rabbits are going at the airport when you are dropping them off. The health certificate gets put in a bag and taped on the top of the carrier. I send the rabbits with a coop cup full of their feed mixed with an oat/barley mixture. This will encourage the rabbits to eat, as they want the treat (oat/barley) in the feed. I also shove a small handful of hay at one end of the carrier so that they have something to munch on as they are traveling (and waiting in the airport). Apples & carrots that have been soaked in water overnight help with appetite and water. Even if I don't get to soaking the apples/carrots ahead of time, I send the rabbits with those in their cage to help with the stress of the journey. I also send some of the rabbits feed & the oat/barley mixture with them in the tray of the carrier. 3 sandwich bags easily fit in the tray below the rabbits (with a few shavings to absorb any liquid/urine from the rabbits). The pedigrees can also be sent in the tray. I place them in an envelope in a ziplock bag and it works perfect!